As it turns out quite a bit! Looking for some tasty new ways to enjoy your favorite ice cream? 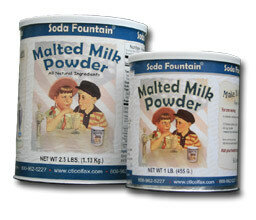 With our Soda Fountain ® Malted Milk Powder you can create amazing cold desserts that will satisfy everyone. But that's not all! Baking with malt powder is a well-kept secret that makes cakes and cookies amazing. Peruse some of the malt recipes here to get some great ideas for your next dessert! Mix in a blender or electric mixer. 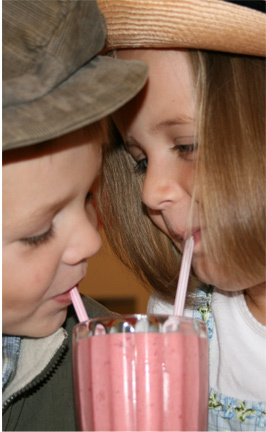 A smoothy machine works great too. Pour in a tall glass and serve with a spoon and straw. Each of the following recipes start out with your basic malt recipe. into the glass, drizzle chocolate syrup over top and sprinkle with chopped nuts, whipped cream and finish with a cherry. Caramelized Banana Malts Check out this amazing recipe from one of our blogger firends! Cocao NIB Malt Stracciatella Ice Cream Shared by a devoted customer of ours! Enjoy this delicious treat! Malted Bananas Foster - New Recipe! Need a delicious dessert that everyone will love? Strawberry Malt - Strawberry ice cream. Add additional strawberries or strawberry jam for a more intense flavor. Chocolate Covered Cherry Malt - Make a vanilla malt. Add chocolate chips and add fresh or maraschino cherries, cut up and blend. Extreme Chocolate Malt - Add to your chocolate malt chopped chocolate pieces, bits of fudge brownie and white chocolate chips. And nuts if desired. Peach Cobbler Malt - Add to a vanilla malt, chopped fresh peaches, canned peaches or peach preserves. Blend. Add crushed up wafer cookies, mix with a spoon. St. Patrick's Day - Shamrock Minty Malt Parfait - Minty, Chocolate, Malty taste! Refreshing dessert.